The best colors for your front door are the ones that give your home instant curb appeal and cater to your taste. First and foremost you want to insure that you have a paintable door. Consider the door a blank canvas where you can express your own style. The front door is a unique space suitable for any color selection regardless of the color of the home. 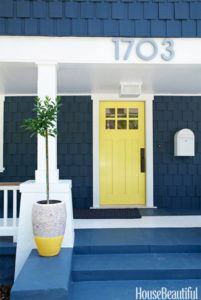 It is not uncommon to see a red door or yellow door with no corresponding accent or hue on the home. The front door is one of the first impressions a visitor gets when visiting your home. It should be welcoming and friendly. 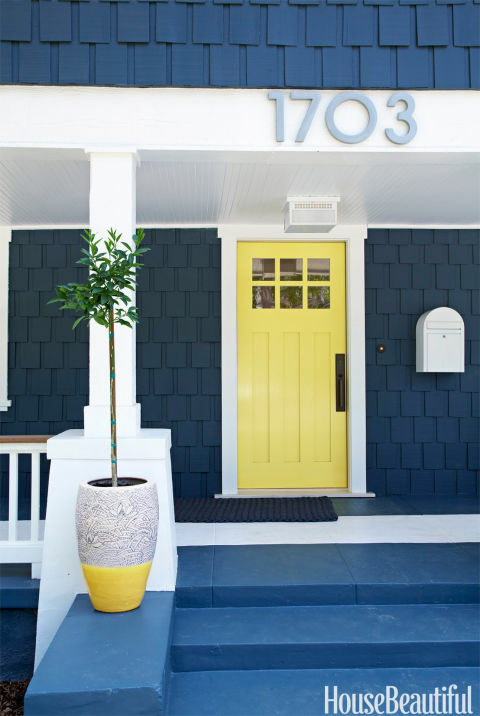 One of the best things about painting your front door is that it’s a simple project and whatever color you select it can be easily changed should you decide to. It is also a very fast way to change the impact your home has in your neighborhood. One of the added benefits to selecting your own unique color is it’s aid in wayfinding; helping people orient themselves and navigate from place to place. “My house is the one with the yellow door”. Here is a nice link to give you some color ideas. It’s not difficult. A few quality tools and paint is all you really need. First the paint. I suggest a quality exterior latex primer and top coat. Don’t use an interior grade paint product even if you have a storm door between the front door and the outside. A good primer is ICI Gripper or Pittsburg’s Seal Grip. A good quality exterior latex such as Pittsburg’s Sunproof or Manor Hall is a great choice. You won’t need more than a quart of each. Exterior grade products have mildewcides and UV protection that a front door will need. First decide if you are painting just the front or the sides as well. If you are painting the sides too it may be easier for you to remove the door and put it on sawhorses. Next remove everything you can like door knobs. You get better results this way. Don’t try masking around the door knob. If you are not painting the sides then tape them off tight to the front edge of the door so you get a well defined line and don’t have paint creep. Paint on the sides you don’t want. If there is a window you can tape the glass edge if you need too. Clean the door if needed and sand lightly. If you use a cleaner, like Simple Green, rinse well. If you have a raised panel door I suggest brushing the raised panel areas first and then rolling the flat areas of the door and back brushing after the roll. One coat primer and two top coats and your all set.